You are currently browsing the tag archive for the ‘lyon’ tag. From October 3rd 2004 to November 22th 2005, Mr. Luc Lienhardt was detained pending investigation at the jail of Saint-Paul in the second largest city in France, Lyon. On January 19th 2006, a court-ordered report on the conditions of detention was released. It was revealed that the jail was overcrowded to a critical point. More than 800 detainees were detained in that jail built for 360 detainees. The applicant was detained in a cell with 2 other detainees. The conditions of detention were appalling as shown is this picture taken in a cell with 4 detainees. During his detention, the applicant suffered “brief psychotic disorder” for 3 months as a result of his detention. No medical treatment or therapy were provided to the applicant. On March 25th 2008, the applicant filed a criminal complaint to an investigating judge for “torture” and “degrading treatment resulting from housing condition” (art. 225-14 of penal code). On January 20th 2009, the supreme court (Cour de cassation) ruled that article 225-14 of penal code didn’t apply to jails (case 08-82807). On September 18th 2008, the applicant filed a lawsuit at the administrative tribunal of Lyon for compensation for his condition of detention. On February 17th 2010, Mr. Luc Lienhardt filed an application with the E.C.H.R arguing that his conditions of detention during more than 13 months were a violation of article 3 of the Convention, and that the lack of effective remedy was a violation of article 13 of the Convention. On June 2th 2010, the application was communicated to the agent of the French governement with questions to be answered before 16 weeks. The applicant is represented by Me Sylvain Cormier (Lyon) who didn’t answer our request for information. The jail of Saint-Paul was definitely closed on May 3rd 2009. 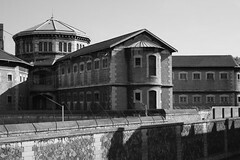 It was then revealed that more than 900 detainees were held in this jail in February 2008. On December 6th 2010, it was announced that the administrative tribunal of Lyon awarded the applicant €2,000 for his 13 months detention in the horrendous jail Saint-Paul but declined to find a violation of article 3 of the Convention. On September 13th 2011, the Court ruled the application inadmissible on the ground that the applicant didn’t appeal the judgment of the administrative tribunal of Lyon.